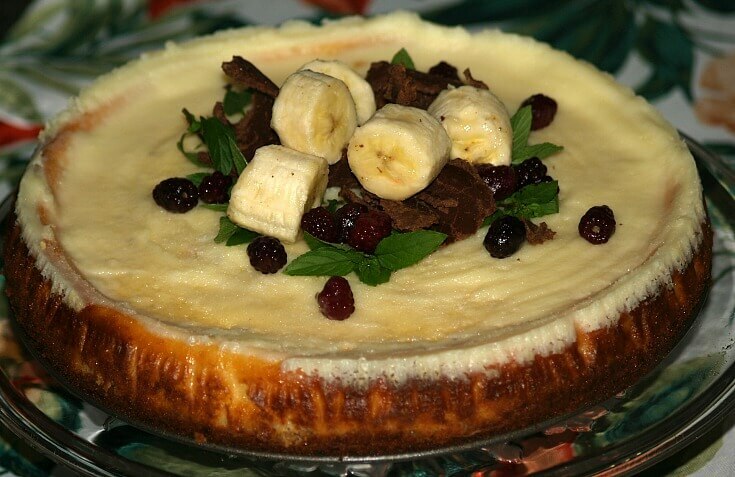 You must learn how to make a banana cheesecake recipe if you love cheesecake. The banana is one of the best loved fruits of the world if not the very best. Every person I know, despite what country, will tell you the banana is among their favorites. This is quite obvious when you hear cooks talk about their favorite banana desserts, especially banana pudding. 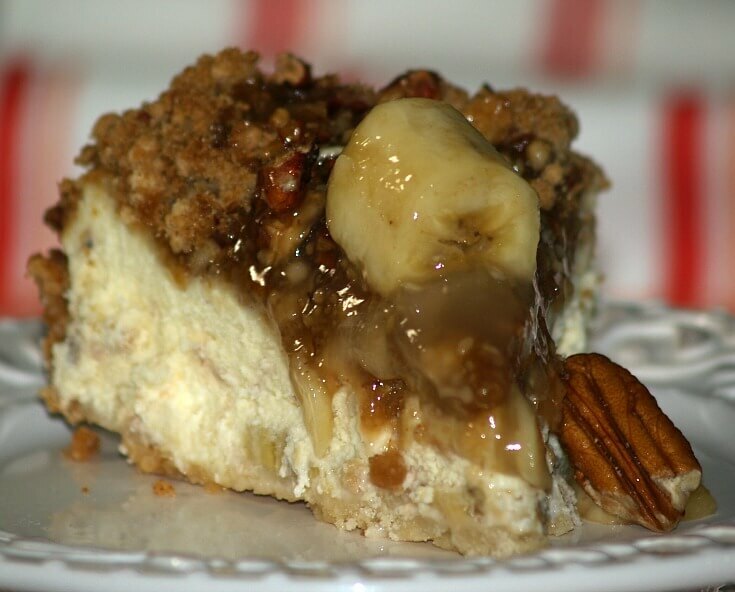 Like banana pudding, banana cheesecake recipes have that great combination of bananas and cream. Also like banana pudding, some recipes include vanilla wafers. For cheesecake lovers, we get the added benefits of a variety of rich creamy cheeses. The crusts for cheesecakes offer us a wide variety of flavors and textures to choose from. The most traditional cheesecake crust is graham cracker. There are also cookie crusts, cookie dough nut crusts and pastry crusts. With all these different flavors can be made by adding lemon or orange peel, chocolate, etc. 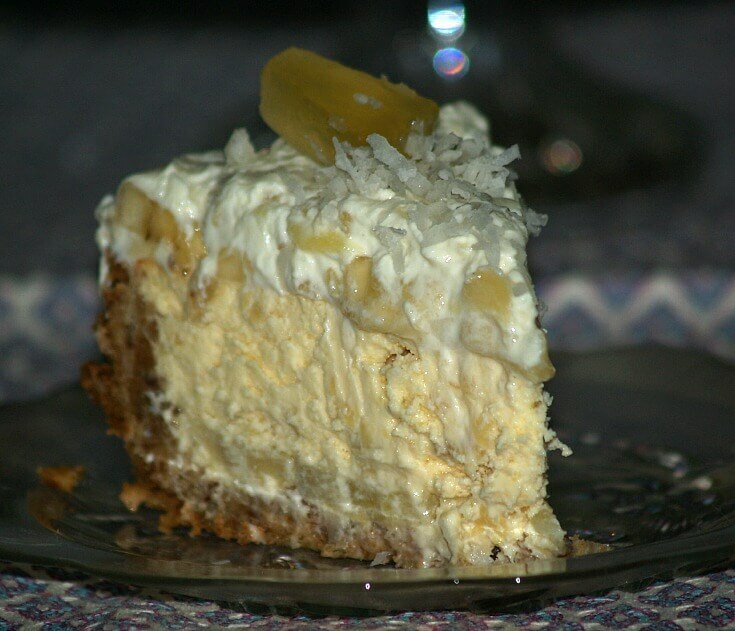 When making banana cheesecake recipes, the banana flavor can come from different sources. Fresh bananas are almost always used. Sometimes you will be instructed to dip the bananas in lemon juice to keep them from turning brown. This is the “down side” of using fresh bananas but they offer the freshest taste and are not a big problem. Other sources of the banana flavor come from banana pudding, banana flavoring or extract and banana liqueur. Some recipes will use a combination. Preheat oven to 350F degrees; lightly grease 9 inch spring form pan. TO MAKE CRUST combine first 5 crust ingredients. Stir in melted butter; press into bottom of prepared pan. Bake 10 minutes until lightly browned; cool on rack. TO MAKE FILLING combine bananas and lemon juice; set aside. In large bowl beat cream cheese and sugar until smooth. Beat in sour cream, cornstarch, vanilla and salt. Add eggs beating on low just to combine; fold in banana mixture. Pour into prepared crust; place pan on baking sheet in oven. Bake 50 to 60 minutes until center is almost set. Let stand 5 minutes. FOR TOPPING combine sour cream, sugar and vanilla; spread over top. Return to oven and bake additional 5 minutes. Cool on wire rack for 10 minutes; run knife around edge to loosen cake. Garnish with fruit to serve. TO MAKE CRUST combine and blend all ingredients in medium bowl. Press firmly in bottom of 8 inch spring form pan. TO MAKE FILLING beat cream cheese in small bowl until light and fluffy. Add pudding mix and milk; beat until smooth. RESERVE about ¾ cup of the thawed Cool Whip; cover and refrigerate. Fold remaining Cool Whip into cream cheese mixture; spoon into crust. Freeze at least 5 hours until firm. TO MAKE SAUCE combine raspberries, sugar and liqueur in saucepan. Stir and heat over medium until sugar melts and mixture begins to boil. Cool mixture; process in blender until blended about 3 minutes. Strain to remove seeds; stir in diced bananas. 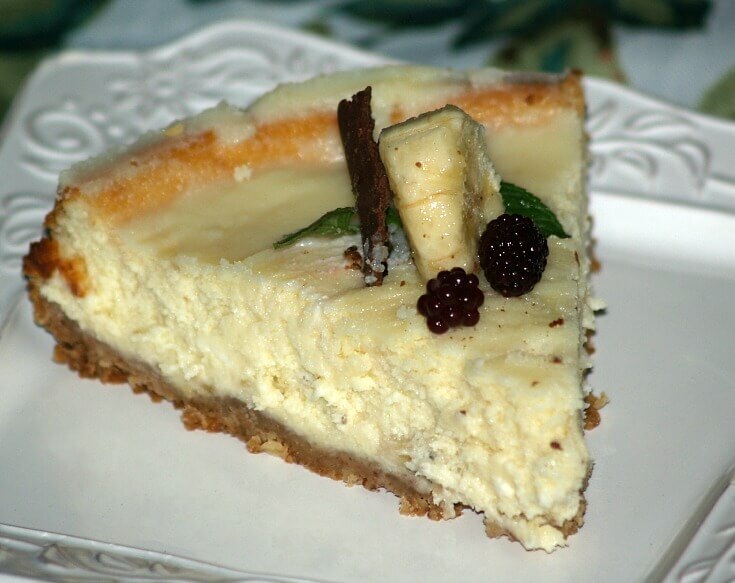 TO SERVE allow cheesecake to set in refrigerator 1 hour to thaw slightly. Spoon raspberry banana sauce over top; garnish with reserved Cool Whip. Preheat oven to 350F degrees; lightly butter 9 inch spring form pan. Combine crumbs and sugar in small bowl; stir in butter. Set aside ½ cup of mixture for topping. Press remaining crumb mixture in bottom and up sides of prepared pan. Bake about 6 minutes; cool completely on wire rack. TO MAKE FILLING beat cream cheese and sugar together in a large bowl. Fold in 2 cups of the thawed whipped topping. 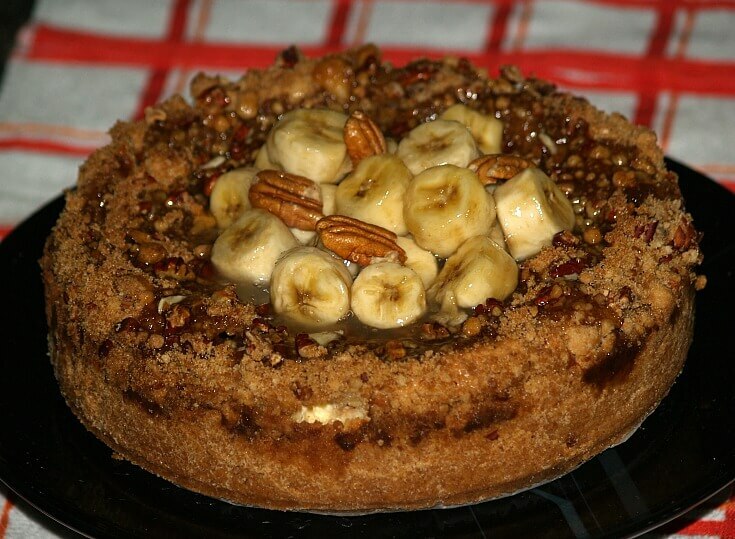 Arrange HALF of banana slices in the cooled prepared crust. 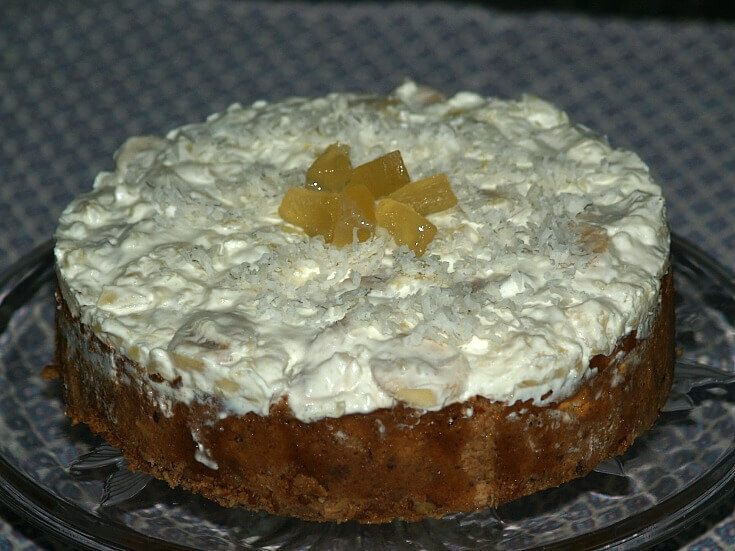 Top bananas with HALF of the cream cheese mixture. Repeat layers; remaining banana slices and remaining cream cheese mixture. PREPARE PUDDING in small bowl beat pudding and milk together for 2 minutes. Let pudding stand 2 minutes until soft set; fold in remaining whipped topping. Pour mixture over the cream cheese layer in crust; sprinkle with reserved crumb mixture. Preheat oven to 325F degrees; 9 to 10 inch Ungreased spring form pan. FOR CRUST combine all crust ingredients in bowl. Mix until crumbly; reserve 1 cup for top. Press remaining crumb mixture in bottom and 1 ½ inches up sides of pan. Slice bananas lay over crust; set aside. FOR FILLING combine cream cheese, sugar, flour and rum in large bowl. Beat cheese mixture until smooth; add eggs and mix well; stir in toffee bits. Combine reserved crumb mixture, brown sugar and pecans in bowl. Blend mixture well; sprinkle evenly over the filling. Bake for 70 to 85 minutes until center is set and topping is golden. combine water and corn syrup in saucepan. Stir in brown sugar and cornstarch; cook and stir until thick and bubbly. Remove from heat; stir in banana liqueur; cool. Gently stir in banana chunks; spread over cooled cheesecake. Refrigerate at least 4 hours; remove sides of pan to serve. Preheat oven to 350F degrees; grease 9 inch spring form pan. TO MAKE CRUST combine crumbs and sugar in a small bowl. Stir in melted butter until blended; press in bottom of prepared pan. Bake for 10 minutes; remove from oven and cool on rack. NOTE: Increase oven temperature to 400F degrees. TO MAKE FILLING FIRST line the cool crust with sliced bananas. In a large bowl beat the cream cheese and sugar until smooth. Beat in eggs, flour and lemon peel until blended; stir in sour cream. Pour cheese mixture over the sliced bananas in crust; smooth top. Bake 45 to 50 minutes or until center is set; turn oven OFF. Let cheesecake set in oven with door AJAR for 3 hours. TO MAKE TOPPING combine sugar, salt and cornstarch in saucepan. Stir in boiling water; cook and stir over medium heat until thickened. Stir in gelatin until blended; set off to cool. Stir in strawberry halves and banana chunks. Spoon over cool cheesecake; cover and refrigerate 4 hours to overnight. TO MAKE CRUST combine crumbs, coconut, nuts, sugar and butter in bowl. Blend mixture well; press in bottom and up sides of 9 inch spring form pan. TO MAKE FILLING beat cheese until fluffy in large mixing bowl. Gradually beat in canned milk until smooth; add eggs and orange juice mixing well. Stir in ¾ CUP of the drained crushed pineapple. Line top of crumb crust with slice bananas; pour into prepared pan. Bake 65 minutes until center is set. Spread sour cream over the top; bake 5 minutes longer. Cool on rack until topping is ready. TO MAKE TOPPING combine and mix sugar and cornstarch in small saucepan. Add reserved pineapple juice and remaining pineapple. Cook and stir over low heat until thickened; cool to room temperature. Gently stir banana chunks into the cooled pineapple sauce. Spread mixture over cooled cheesecake; refrigerate several hours until cold.